A farmer and his wife are attacked in their remote home by what appears to be zombies. At a horror convention, filmmaker Alfonso Betz is onstage discussing media being blamed for real-life violence. Russell and Duane listen in the audience, but Duane is disinterested and talks over the speaker. In the cafeteria later, Russell and Duane are invited to a private party by a seductive goth girl. Russell and Duane go to a secluded farmhouse for the party, along with other horror fans. The partiers drink keg beer and get to know each other before seemingly passing out. Russell awakens with a girl named Karen in a cemetery, dressed as two leads from “Night of the Living Dead” and without a memory of how they got there. A zombie approaches and bites Russell’s throat while Karen runs away. She finds Duane, who has just awoken inside of a truck. She takes refuge in the farmhouse and tells Duane what happened. Disbelieving, Duane looks for Russell and then carries him back to the farmhouse after seeing the zombie. Karen hears voices coming from a vent leading to the house’s basement. Duane explores the top floor and finds a room where all modern technology has been stored. The rest of the house is made to look like it is the 1960’s. Duane also finds the dead bodies of the farmer and his wife. Duane decides to take Russell to a hospital in the truck but retreats to the house after three zombies approach. Duane has to leave Russell outside and the zombies tear him apart. The original movie plays on an old television set in one of the rooms. Karl wants to take the truck and escape, but the group overrules him. Duane sneaks out from a top floor window and makes a run to the shed out back for tools. He kills one of the zombies by stabbing garden shears into its throat. Duane returns to the house. Keith adds that it is a good thing that Karl did not take the truck because it blows up in the movie. Karl sneaks outside to hotwire the truck anyway. The rest of the group screams for him to stop, but he blows himself up. Zombies enter the home. Most of the survivors retreat to the basement. A female zombie bites the leg of Karl’s wife before Keith stabs her through the back with the shears. Keith puts a pitchfork through the face of a clown zombie. Duane wrestles with another zombie before Keith chases him upstairs. Upstairs, Keith finds another survivor named Owen. Duane believes he is out of place because he is not a character from the movie. Owen reveals that he was one of the zombies but had a change of heart. The zombies are actually psychopaths that are playing a role-playing game to live out a horror movie instead of simply watching one. They are using metal teeth to bite their victims. A zombie surprises them and kills Owen while the others escape. In the basement, Keith and Duane pull a necklace off the clown zombie’s corpse and realize Judith has the same necklace. She says that she did not know what was going to happen. She was only paid to lure people to the party. Keith throws her outside where the zombies chase her. Duane thinks Judith should be rescued. Keith objects and the two of them fight. Karen smashes the TV so that they will stop. Duane goes after Judith. Judith hides in a car but two zombies capture her. She is brought to a basement where Alfonso Betz is also a prisoner. The zombies plan to stage a murder-suicide so that the film director will be blamed for the massacre as if he broke from reality and went insane. Betz rails against his captors before the lead zombie shoots him through the head. Keith goes upstairs to retrieve the shears from a zombie’s body. He finds a cell phone on the body with footage of his girlfriend seen at the party being murdered. Another zombie records him as Keith squats over the body. Owen is still alive and grabs Keith. Another zombie comes and stabs Keith while streaming it on his phone to the other zombies. The lead zombie complains that the behavior is inconsistent with a Romero zombie. Duane makes it to the basement and kills the zombie who was about to put an axe into Judith. The two remaining zombies go to the farmhouse. Karen tries to pitchfork one of them but the tool is wrestled away from her. While attacking the little girl, the mother puts a tool through the head of one zombie. Karen points a gun at the other zombie as Duane and Judith reenter. The lead zombie gives an unremorseful speech before Judith approaches him with a kiss and then uses the metal teeth to bite his throat. Duane then shoots him. A news interview with a police officer wraps up the events. Whenever an independent horror film labels itself as an “homage,” it is usually the case that the term can be replaced with “rip-off.” When that homage is to a revered classic, it can further be seen as cheap exploitation. Toss in a pat group of partying teenagers and my skepticism primed me for believing that the only positive thing to come from “Mimesis” would be its resuscitation of a largely forgotten and little used word. With a definition that includes the terms “mimicry” and “to imitate,” it might be logical to assume that the movie would be exactly that. An imitation. Sometimes it takes something old to make another thing new again. 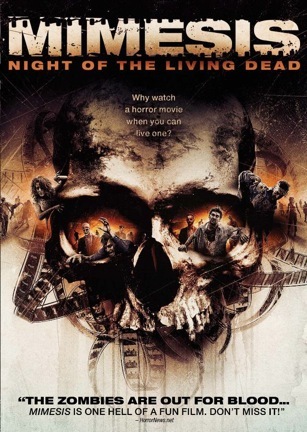 “Mimesis” does not cheaply exploit “Night of the Living Dead.” It creatively uses George A. Romero’s classic to deliver a different spin on the genre. It is the same story set in a frame that makes the telling both unique and contemporary. An eclectic mix of horror convention attendees thinks they are partying at an exclusive event. But when they wake up in the morning without any recollection of the night before, they find themselves in costume at a secluded farmhouse. They are about to role-play a real-life reenactment of “Night of the Living Dead,” and they have no idea why. There is no shortage of movies that have taken advantage of “Night of the Living Dead” (NotLD) falling into the public domain. As such, anyone with a camera and something to put in front of the lens can make a movie and use NotLD in its name. Perform a title search on IMDB. One can find “NotLD: 3D,” “NotLD: Resurrection,” “NotLD: Reanimated,” and several dozen more. In “Mimesis,” the “Night of the Living Dead” angle is not a throwaway setting. “Mimesis” avoids turning into its title by revering the source of its inspiration without becoming a slave to it. Although the route it takes to create its own identity is not without road hazards. The production puts too much emphasis on shoehorning visual flair into the movie, and cannot seem to settle on exactly what style it wants there to be. It is an inconsistency that draws more attention to itself instead of establishing a discernible mood or feeling. Unless that feeling is supposed to be confusion. At seemingly random intervals, the perspective shifts to a canted angle. Yet the corners of the frame are usually not populated with anything interesting. I imagine the camera tilts are intended to be disorienting. I found them to be disengaging. At other times, the footage is processed in a style that seems as random as the inclusion of Dutch angles. One strangely included effect is a slowdown of the action before the pace suddenly doubles and then returns to normal. (i.e. 1x speed to -1x to 2x and then back to 1x.) At first, I truly thought there was a problem with my playback control, as the technique never fit the context. These abrupt speed changes are utilized for such sequences as bringing cafeteria trays to a table and walking into a convention hall. If there was an intended purpose, it was lost on me. Occasionally, scenes of zombie attacks briefly mistake themselves for a 1990’s music video with a quick blinding film flash before several cuts. Some zombie attacks have the flashes. Some do not. Whatever pattern was meant, again it did not make itself clear. Even the lighting is a stylistic mix. Sometimes it is a traditional three-point style. Sometimes it bounces off of the chest Michael Ballhaus-style. By no means does the movie look bad. It just appears as though it had no definitive direction on the look it meant to achieve. If the credits did not say otherwise, I would have guessed the movie was shot or edited by at least three different people, with none of them working off of another’s notes. The staging is more focused on giving the cast an excuse to unintentionally sneak behind one another rather than provide any sensible motivation for various movements. The group may be confined to a weathered farmhouse with wood floors, but everyone seems to have the uncanny ability to walk without a sound and only knows how to turn someone’s attention with a well-timed shoulder grab from behind. The third time this happened I wondered if soft shoes were included gratis with everyone’s costume. Jump scares have more punch when they are a little less telegraphed. Having spent the last six paragraphs criticizing the movie, how is it that I can still recommend “Mimesis?” Because it is entertaining. Its flaws are distracting, not damaging. Even if they do not succeed, the jump moments and style choices are designed with a sincere intention to scare and to create atmosphere. It may not always work, but it does not feel amateurish or desperate. Simply misplaced. The concept behind the story is intriguing. Are these people being hunted by zombies or by humans? Who or what did this to them? And why NotLD? How the mystery would play out sustained my interest in spite of the technical drawbacks. It might have been cleverer for “Mimesis” to exploit forgotten aspects of the original film as a way to introduce new twists and spins on familiar tropes. But then, the movie is not interested in being more complicated than necessary. For instance, it had been so long since I had seen the original NotLD, I could not remember how many survivors were supposed to be in the house. If the unwitting role-players had similarly foggy recollections about events from NotLD, suspense could come from characters searching scrambled memories for clues to their predicament. There are flashes of that already in “Mimesis,” specifically the role of the pickup truck, but I would have preferred more. Sid Haig’s dialogue exists mostly to posit questions on a possible relationship between violent media and violent behavior. They are well-worded thoughts, although the themes of the movie do not necessarily fully explore the debate. That may be a good or a bad thing. Bad that the story fails to elevate its contemporary relevance. Good that it does not crush itself under the weight of heavy-handed social commentary. The movie never really takes a clear side in that debate. The concept is sort of put out on a plate and the audience can choose to pick at it if they want. Once more, “Mimesis” starts down a deeper direction only to pull back in favor of a more straightforward effort. And it is probably better for it in the end for having not tried fighting battles on too many fronts. It may be rough around the edges, but “Mimesis” intends mainly to entertain above everything else it sets out to do. Regardless of where its shortcomings may lie, it is this intention that comes through the clearest. An unfamiliar cast of actors. A limited budget. Shot on location in the rural Midwest. Add name-dropping a legendary film within the title and “Mimesis” has all of the necessary ingredients to brew a steaming waste-of-time. Yet “Mimesis” remembers that those are also the same ingredients that Romero had to create the film being emulated. Handled with care, those seemingly detrimental elements morph into advantages for creating an enjoyable independent horror film. And in that regard, “Mimesis – Night of the Living Dead” succeeds. February 20, 2013 by Ian Sedensky.